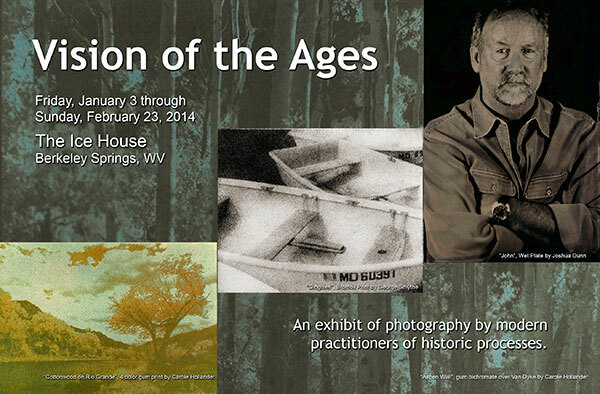 I am proud to have been asked to curate the upcoming gallery exhibit, “Vision of the Ages” at the Ice House in Berkeley Springs. This is a special exhibit of photography by modern practitioners of historic processes. 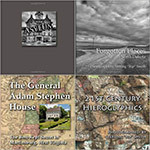 Images captured with cameras originally designed in the 19th century or state-of-the-art digital cameras are printed using techniques first invented as early as the 1840’s. Included in the exhibit are examples of wet plate collodion images, tintypes, bromoil prints, gum bichromate prints, cyanotypes, Vandykes, silver gelatin and more. Completing the “fusion” of techniques, images captured with a large format view camera are printed with state of the art digital printing techniques. The exhibit provides a fascinating walk through the history of photographic processes. The Ice House is located at the corner of Mercer and Independence streets in Berkeley Springs, WV. There is an opening reception on Friday January 3 from 7:30-9pm. Here are a couple of views of the gallery. But don’t think you have any idea of how great this work is by looking at these photos. Come to the reception and meet the artists if you can, but if you can’t make the reception, at least plan to get out there to see the show. It’s on display until February 23. ~ by Admin2 on January 1, 2014.